Twenty minutes from the renowned artist colony of Nashville, in Brown County, a series of scenic, winding country roads lead you to the authentic 19th century town of Story, Indiana. This historic hamlet, once the largest settlement in the area, is now a country inn. That’s right, the entire town of Story is a country inn, complete with an old general store, gourmet restaurant, tavern, weather-beaten barns, an old-fashioned sawmill and other original structures that have been renovated and turned into cottages available to rent. Sound interesting? Here’s the story. Dr. George Story founded the town of Story, Indiana in 1851. He acquired the land by grant from the federal government at a time when it literally gave land away to encourage the settlement of the west. Dr. Story is not simply the town’s namesake. He actually built most of the town’s structures, which at its peak included two general stores, a church, a schoolhouse, a blacksmith, a grain mill, a sawmill, a slaughterhouse and a post office. But Story’s success stopped abruptly in 1929 with the onset of the Great Depression. People who farmed the land surrounding Story could no longer make a living and left everything behind to find work. Many of those who stayed behind eked out a living bootlegging bathtub gin. Gradually the town of Story became as withered and lifeless as the abandoned farms around it. By 1940, Brown County had lost half of its population due to the Great Depression. As the taxes on the property left behind went unpaid, the State foreclosed on them. Today, 80% of the land in Brown County remains forested for this reason. This land was used to create what is today Brown County State Park and Hoosier National Park. These parks now surround the Story Inn. The Great Depression came through Story like a long harsh winter, freezing it in time. After struggling for decades, the general store closed in the early 1960’s. 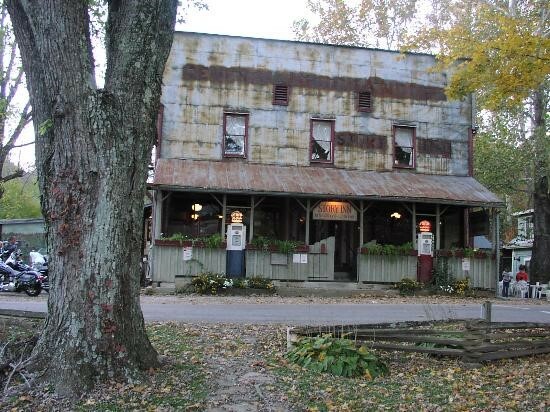 The general store was converted into a restaurant and inn, and several owners tried in vain to make it work. But none were successful, and the town went up for auction in 1998. Rick Hofstetter and Frank Mueller purchased it with the vision of converting the entire town into an inn, incorporating the original buildings surrounding the general store. Their vision was guided by the principle that everything was to remain authentic. They did not buy Story to develop it. They bought it to restore it. 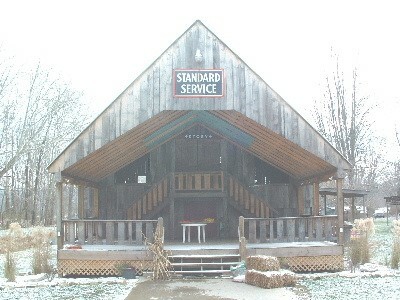 The centerpiece of the Story Inn is the old general store. Guests must be forewarned that upon approaching this structure they might be hit with the sense that they have stepped into the Twilight Zone, somehow transported to a small Midwest town at the turn of the century. “What the heck did we just get ourselves into?” I couldn’t help but wonder aloud as my wife, Christine, and I arrived at the Inn. We stopped dead in our tracks just to get a good look at the building. We never would have thought this was a country inn. Two well-preserved Standard Oil Crown gas pumps stand in front of the store, still waiting for a Tin-Lizzy to pull up for fuel. The front of the building looks weathered and tired. The tin roof has streaked rust down the top of the primer colored outside walls. And if you look close, you can see the words “General Store” faded on the front of the building. It wasn’t until we entered the general store to check in that we were convinced that this was really an inn. What a contrast we noticed upon entering the building. While the outside appeared neglected, the inside reflected the meticulous thought and care that went into this inn. We began to appreciate the beautiful job done in balancing the opposing objectives of preservation and renovation. Both were equally needed to create the charm of this remarkable inn. And the Story Inn is proof that one doesn’t have to come at the expense of the other. In keeping with this idea, the first floor of the general store has been converted into a gourmet restaurant. Because the original structure remains, it has an authentic turn of the century feel, complete with creaking wooden floors. Although the ambience is incredible, the restaurant has built its reputation on its first class food. We heard that people come from as far as Louisville, Kentucky for dinner, and the food is that good I don’t doubt it for a second. The cellar has been converted into “The Story Still,” a tavern adorned with Story memorabilia. A rickety wooden staircase leads to the second floor where there are four unique guest rooms. Each room is modern enough to have a private bath and air conditioning, yet in remaining loyal to its 19th century charm, there are no televisions, phones or clocks. The Blue Lady room is the most colorful of the four traditional bed and breakfast rooms available above the restaurant. Legend has it that this room is haunted by a friendly apparition who appears as a woman wearing a blue dress. Although no one knows why she haunts the room, guest books dating back to the 1970’s record bizarre things happening in the middle of the night. Some report that their champagne glasses are turned upside down by morning, or their hair brush was moved. Others report actually seeing her reflection in the window or the mirror. Christine and I stayed there for the night, and although nothing strange happened, it was exciting. It was fun to read the old guest books in the quiet of the night while lying in bed. This room is typically booked, so if you can get it, take it. There’s just something about a good ghost story that makes you feel like a kid again. After spending the night in the Blue Lady room, we explored the rest of Story. Behind the general store, there is a turn of the century barn that has been recently renovated into a bandstand. 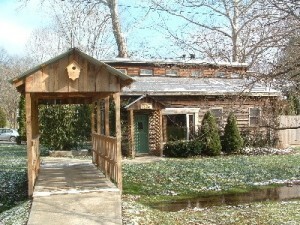 The field surrounding the barn is large, and this area is now used for weddings, wine festivals and other celebrations. Next to the general store is the Sommergarten. Local musicians play in this little square in the spring and summer. Within sight of the general store, several original structures that were once homes and businesses have been carefully converted into cottages available to rent. Combined, these cottages provide accommodations amenable to families and couples alike. Dr. Story’s house stands on a hill overlooking the town. What used to serve as his examination room remains across the street. His house has been converted into two cottages, one on the first floor and one on the second floor. Each has one bedroom with a queen bed, a living room and a second bedroom with a double bed – perfect for those guests traveling with children. Most of the cottages, however, are located across the street. Directly across the street from the general store, in the center of town, sits the old Wheeler Homestead. Once occupied by the owner of the general store, it is now two cottages. The front cottage is perfect for families, as it has two bedrooms, a full kitchen and a private deck. The back cottage is perfect for couples, as it has a kitchenette, a private bedroom with a queen size bed and a separate room with a six-person hot tub. We walked across a miniature covered bridge to the Treaty House. 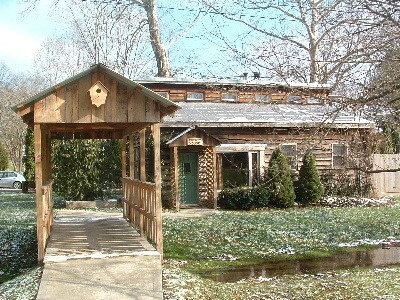 This was originally Story’s sawmill, but now is a cottage providing the perfect romantic hideaway. The first thing we noticed when we entered is that the couch is turned towards the window, with a beautiful view of the brook and the miniature covered bridge. The Treaty House has a vaulted ceiling, a living room, a queen sized bed and a very private deck with a five-person hot tub. Next we visited the Carriage House. This cottage is also ideal for couples celebrating romance. What makes this cottage so beautiful and romantic is that it has a room solely devoted to a hot tub, complete with a mural. Your lover may swoon if you stay in either of these cottages! The Brown Cottage is close to the main road. It is actually two cottages, one in front of the house and one in back. It has a beautiful antique wagon adorning the front lawn. The front cottage is ideal for families, it contains a living room with a sleeper sofa and a kitchenette. 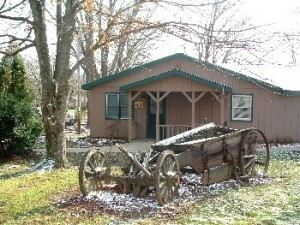 The back cottage is ideal for couples, it’s smaller and has a cute porch and swing. We ended our tour with the Plum House. This home is also two cottages, one on the east side and one on the west. The house is set way back from the main road, although it is still in view of the general store. Both cottages are suitable for small families or couples, but what sets them apart from the rest is that they can open up together to accommodate a large family. We left Story knowing that this time, it was here to stay. Story, as a town, may have never recovered from the Great Depression. Story, as an Inn, however, is quite another story.